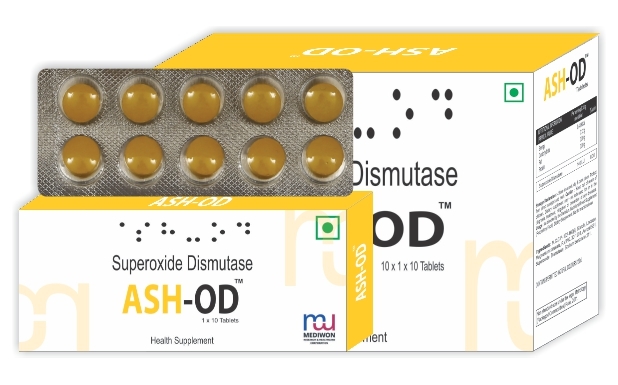 Superoxide dismutase is an enzyme which makes up an important antioxidant system in the body. They neutralize free radicals (harmful by products of cellular respiration), particularly the superoxide radical, and the most common free radical in the human body which is protecting the body's cells and tissues free from radical damage. This dietary supplement promotes the body's natural antioxidant system. By combating oxidative stress, it helps provide real health benefits. Oxidative stress occurs when there is imbalance between the production of free radicals and the body's ability to defend or detoxify their harmful effects. Our body creates energy by burning nutrients with oxygen, but in the process of generating energy, certain inevitable oxygen molecules known as free radicals are created. These free radicals are highly reactive and unstable oxygen molecules that play a main role in cell signaling. As we age, the number of free radicals increases and they could damage and ruin any other molecules that they come in contact with (like DNA, proteins, and lipids). As we get older, these highly reactive oxygen species start to gradually damage collagen and the result would be the signs of aging such as sagging or wrinkling. So SOD protects collagen from oxidative stress and fragmentation. The SOD prompted immune cells (macrophages) to release the anti-inflammatory cytokine interleukin-10 rather than inflammatory tumor necrosis factor, which the cells may release under conditions of oxidative stress. SOD also activates the body's production of two other important antioxidants, Catalase and Glutathione Peroxidase and can boost body's antioxidant defense by reducing cellular damage. Superoxide Dismutase (SOD) is a class of enzymes that repairs cells and reduces the cellular damage caused by the most common free radical in the body called superoxide. SOD acts as a catalyst which causes the dismutation of superoxide into oxygen and hydrogen peroxide. As such, it provides the cells in the body with important antioxidant defense 3,500 times more powerful than Vitamin C.
In addition, SOD acts as an anti-inflammatory in the body, neutralizing the free radicals that can lead to wrinkles and precancerous cell changes. It is called 'the Enzyme of Life' when first discovered in 1968, it is produced by the body and is the first antioxidant mobilized by the cell for defense. As a result, SOD is considered more powerful than antioxidant vitamins. Each cell of the body has a personalized system for removing toxic matter. The key "cleansing tool" used for this process is the cell's network of enzymes and enzyme systems. These enzymes work to break down toxic materials and flush them out of the cell. When there are more toxins than a cell's enzymes can handle, or when there aren't enough enzymes in the first place, cells are at risk to become cancer cells. This SOD has a major power in a cell's detox system and scavenges for and dismantles one of the body's most deadly free radical toxins. Superoxide is a reactive particle that bounces around a cell. It damages everything it comes in contact with. This might seem surprising, but the superoxide toxin is actually produced by cells themselves, as a byproduct of their metabolic process to produce energy. When these toxic radicals are produced, the body's natural supply of cell enzymes like SOD acts to shield the cell and quickly eliminate the toxins before they harm the cells. Superoxide dismutase, for instance, functions solely to attack superoxide and break it up into hydrogen peroxide and oxygen.